The solutions developed by the company cover a broad spectrum, including helping recruiter’s gauge the behavioural profiles of candidates during virtual job interviews and assisting in real-time translation in vernacular languages, among others. As artificial intelligence (AI) takes centre-stage in developing new age digital technologies, Microsoft Research Lab in India has come up with a bouquet of cognitive solutions to address specific challenges faced by enterprises as well as individuals. The technology giant said that over 370 enterprises in India are currently using these cognitive application programming interface (APIs) and it is working with over 650 partners to bring AI-based solutions for large, medium and small enterprises in the country. “We have a range of AI-based solutions for enterprises in India. This is spread across vision, speech, language, knowledge and search scenarios. 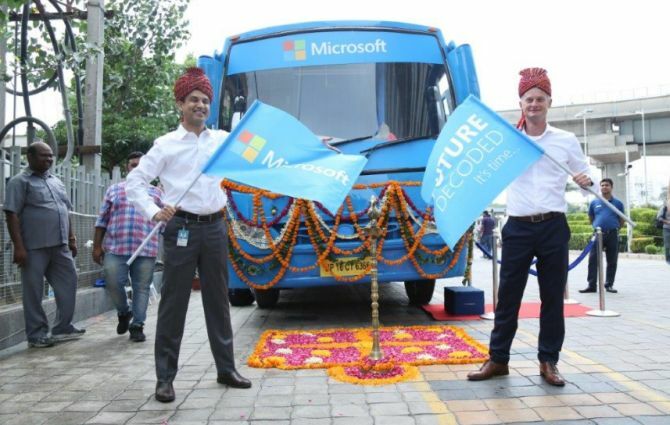 "Apart from these services, data privacy and computing on low resource devices are some of the areas we are currently working on,” said Sriram Rajamani, managing director of Microsoft Research Lab-India. The company said it designed a ‘Seeing App’ meant for the visually impaired which can detect Indian currency and narrate the denomination to the user. Similarly, Talview, a partner of Microsoft, has developed an app which gauges behavioural profiles of candidates during an interview done from a remote location. Bajaj Allianz General Insurance is currently using this solution to hire talent from multiple cities across the country, the company said. Similarly, the technology giant recently launched a solution for real-time language translation in three Indian languages such as Hindi, Bengali and Tamil. “With deep neural networks (DNN)-powered language translation, the results are more accurate and sound more natural,” the company said. Microsoft has also developed chat bots to facilitate automation of various processes in collaboration with its partners. “WittyParrot” is one such platform which is an AI-powered knowledge and process automation platform for sales, support and knowledge workers. The company said, WittyParrot solutions are currently being used by leading IT and ITeS organisations such as Oracle, Couchbase, Collabera and Data Endure. Meanwhile, its social chat bot Ruuh is increasingly becoming popular in India with 1.5 million users. “A user can engage with the chat bot on Facebook in the same way one would interact with a friend. The bot is well versed with Bollywood and has good sense of humour. As an AI chat bot, she is learning increasingly from human interaction to respond emotionally and intelligently,” said Rajamani. Microsoft is also integrating its artificial intelligence solutions with its Office 365 suite. Apart from inculcating a personalised search and better design in its PowerPoint designer, the company is also using data analytics in some of its offering. “MyAnalytics helps in setting productivity goals for users by analysing how they spend time at work, across meetings and during other activities,” he added.